Bruges, called Brugge by its native Dutch language name which assumedly used to signify landing stage, is the capital of the province of West Flanders in present-day Flanders, the Flemish Region of Belgium. It is one of Europe's most important landmarks as the city has hardly changed since the Middle Ages. The municipality comprises the historic city of Bruges proper, considered one of the most beautiful in Europe, and the towns of Assebroek, Dudzele, Koolkerke, Lissewege, Sint-Andries, Sint-Jozef, Sint-Kruis, Sint-Michiels, Sint-Pieters, Zeebrugge, and Zwankendamme. Like Ghent, but on a more concentrated scale, it has most of its medieval architecture intact. There are many beautiful medieval buildings, including the Onze Lieve Vrouwekerk (Church of Our Lady), whose brick spire - at 122m - is Europe's highest brick tower/building. Bruges is also famous for its 13th-century Belfort, housing a municipal Carillon comprising 47 bells. The city still employs a full-time bell ringer, Aimé Lombaért, who puts on regular free concerts. 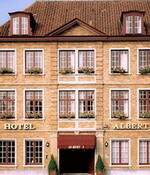 Easy to access and just a short distance from the inner town, the Hotel Albert I offers luxurious accommodation. A charming reception, very comfortable, and cosy rooms, in short a family atmosphere where you feel pleasantly at home. A large and varied buffet breakfast is served. There is a safe underground carpark immediately opposite the hotel (parking Centrum-Zand). The hotel has an internet kiosk in the lounge (1 euro per 1/2 hour). There are 13 guestrooms at Hotel Albert I. Beds come with premium bedding. Bathrooms feature hair dryers. Wireless Internet access is available for a surcharge; guestrooms also offer direct-dial phones, desks, and in-room safes. 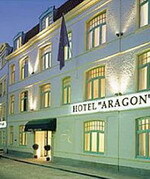 Hotel Aragon is the hotel in the centre of Bruges for a romantic weekend. You stay at a unique location in the centre of Bruges. Hotel Aragon is barely 200 metres from the ‘Grote Markt’ (large Market Square) and the Stock Exchange building, and only 400 meters from the Town Hall and the Castle. Rooms and holiday flats in Bruges - Four-star Hotel Aragon has a wide selection of 42 cosy rooms and 8 spacious holiday flats in the centre of Bruges. You choose which accommodation is best for you. Whatever you choose, Hotel Aragon guarantees you a unique homely experience. There are 50 guestrooms at Aragon Hotel. Bathrooms feature makeup/shaving mirrors, designer toiletries, and hair dryers. In addition to complimentary wireless Internet access, guestrooms offer direct-dial phones and in-room safes. 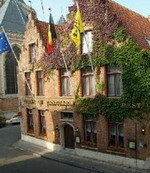 De Castillion Hotel Brugge is located in the heart of Bruges, in the shadow of Saint Salvator's Cathedral. To enter De Castillion Hotel Brugge is set to foot in another world, an oasis of calm, cosmopolitan hospitality and good taste. All the 20 luxurious bedrooms in the hotel depict their own atmosphere and offer the same level of comfort. The guests can begin their day with extensive buffet breakfast richly decorated and served in the cosy breakfast room. Guests can enjoy the excellent menu prepared at the hotel's popular restaurant. You can enjoy a drink in the pleasant atmosphere of the elegant bar, and spend a while relaxing in the authentic art deco lounge. The hotel offers an inspiring setting for accommodating business contacts such as seminars conferences and meetings. The seminar area is equipped with every modern facility.